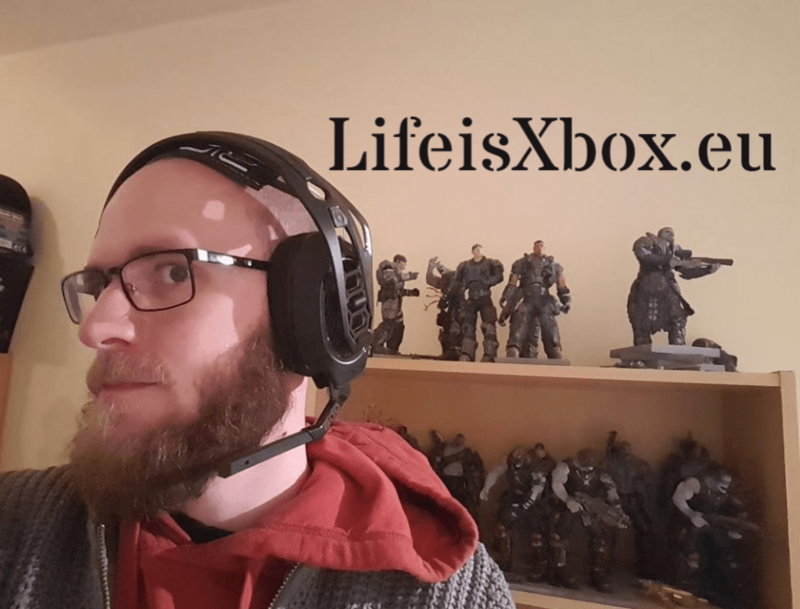 Plantronics was kind enough to give LifeisXbox a review unit and the experience has been impressive. Take a look at this review to see if this wireless Dolby Atmos headset is something for you. Spoiler: the value is unbeatable! The RIG 800LX is wireless, I am not the biggest fan for wireless headphones but this headset is different. One of the reasons why is the excellent light receiver, plugging this in your Xbox One with USB is easy and quick. The best wireless experience I had so far. Plantronics is saying that it has a 10 meter range but it’s actually more, this is the first wireless headset that I can use without performance issues all around my house. I tested it with Spotify and was able to walk outside with three doors closed, a floor down and walk a couple of meters in my garden. Really impressive stuff. 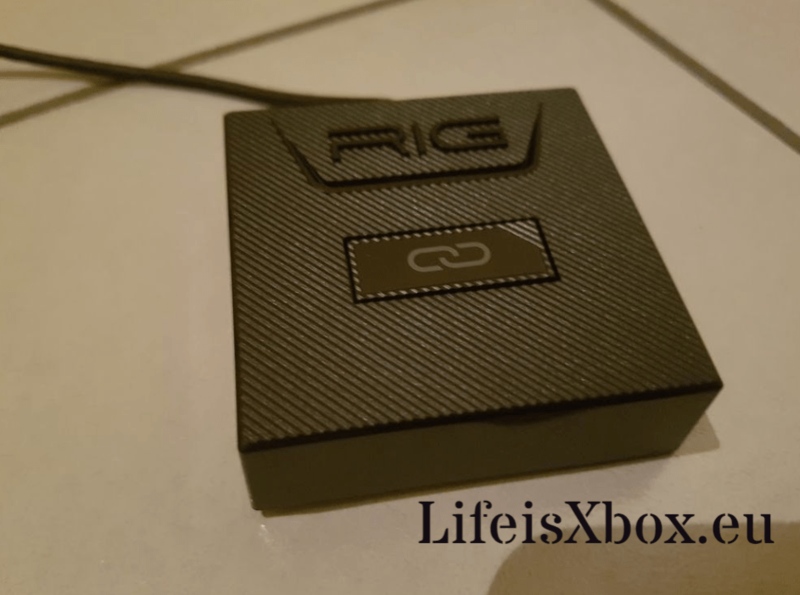 On the receiver you have a PC/Xbox toggle switch too, you can even use the Xbox model on your PS4 as a USB headset but the headset sound functions won’t work. Good for multi platform gamers, but be sure to buy the right mode for Xbox or PS4 if you want the best performance and capabilities. I’ll be honest, the RIG 800LX isn’t something overly impressive to look at, it doesn’t have fancy lights or doesn’t have flashy colours. Plantronics just isn’t that kind of manufacturer. I can’t get rid of the impression that it has a cheap look. I’m not a particular fan about the frame design either, the many angles have a slight futuristic look so if that’s your thing you’ll love it, not me though. Don’t get me wrong with the cheap look either, the headsets frame is solid and lightweight and when holding it you just feel that this thing is built to last and can take some hard abuse. It might not be the looker for me but the design for actually controlling the headsets volume for example is easy and quick in the beginning and once muscle memory starts kicking in it’s a breeze to control everything. I have to admit I’m an audiophile, I even prefer better sound than better visuals. Sound has always had a bigger immersive impact for me compared with pretty graphics. I’m happy to say that the sound quality from the RIG 800LX is bloody fantastic, especially when Dolby Atmos is available. As you know, Dolby Atmos isn’t an option for all games but more and more titles are coming, Microsoft seems to really take a leading role in this with Gears 4, Sea of Thieves and more. If Atmos isn’t available the headset has a 7.1 range. The headset has four modes too, basic – seismic – intensify and vocal focus. For gaming I used the basic mode and for music I used seismic for improving the bass. Intensify had some weird balancing issues with high pitch noise and vocal focus is great for party chat but it wasn’t something that was needed. Party chat was excellent on the basic mode. It’s great to have options though and I was more than happy with the overall exceptionally sound quality. Breathable ear pads means better comfort but less isolation for environment sounds. I tested it with a Senseo coffee machine (first generation) and about 70% of the sound was muted. Still pretty decent and with actual game sound on (volume about 60%) I couldn’t hear my two pinschers bark. Straight to the point, the mic does an excellent job catching my voice and cancelling out other background sounds. Regular friends on Xbox told me that my voice was much more natural and clearer. (I had a Turtlebeach 420X before) One very useful feature is the flip-to-mute, just click your mic up and the mute is active. You hear a slight beep when you mute or unmute the headset. For me the most crucial part about a wireless headset is the battery life. Plantronics is saying it lasts 24 hours, is it? I have been playing with the RIG 800LX for a couple of days now, volume most of the times at the highest and it even lasts longer. Most gamers will be able to play with this headset for a week before it needs to recharge. It also has a quick-charge function, each 30 min charge gives you an hour and half play time. Another useful feature is that the headset has vocal warnings for the battery life, a small little detail but incredible useful. Long gaming sessions with some headsets are a painful experience, especially for those with glasses. Thanks to the flexible head frame and the cosy ear pads the RIG 800LX remains comfortable. Sometimes you don’t even notice that you have it on because it’s a real lightweight (290 grams). Honestly, it is by far the most pleasant headset on my ears. It has just enough contact points and clamping force to remain firm on my head without ever becoming painful or annoying. Biggest reason? you can customize each part of the headset to your liking, for me it was perfect out of the box but you can adjust the headphones and straps how you want, giving you a perfect comfortable fit. The RIG 800LX bundle has a redeemable code for Dolby Atmos, things didn’t really go as planned. I redeemed the code and the Xbox One started downloading “something”. When it was done and I wanted to open that ” something” my Xbox One totally froze and I had to restart the system. After restarting my Xbox it didn’t want to select Dolby Atmos at the sound settings, after some searching I found out that I had to download the application Dolby Access first (link) and activate the Dolby Atmos Headset feature. It wasn’t really user-friendly so the first impression wasn’t really good, luckily after finally setting thing right the experience was really awesome. The Dolby Access application has some Dolby Atmos demo’s too, letting you experience the sound innovation. 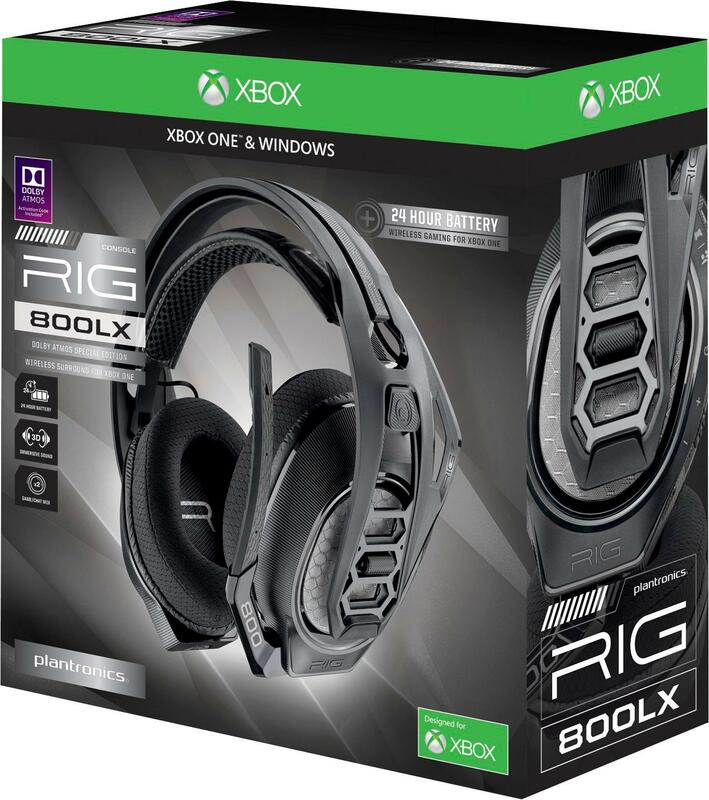 The RIG 800LX with Dolby Atmos is a great purchase for gamers that simply want the best. 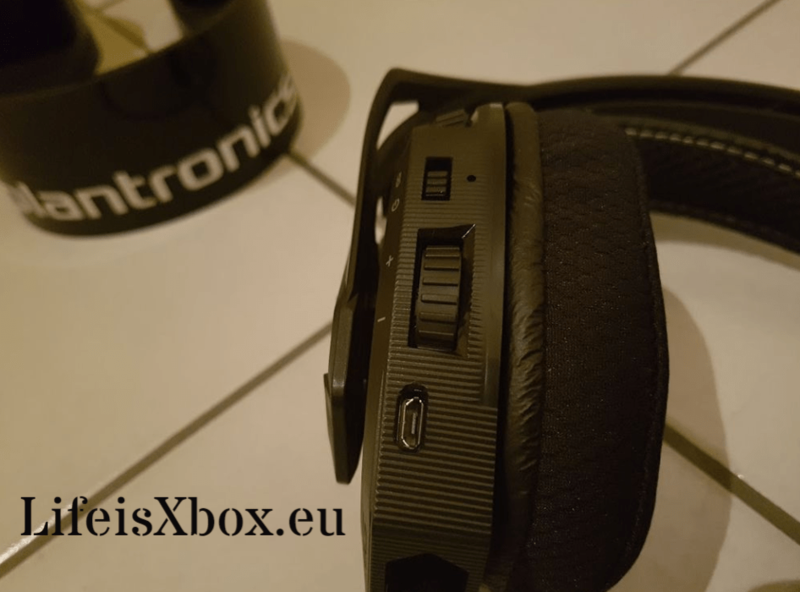 This excellent wireless headset has great battery life, fantastic 7.1 or Dolby Atmos sound quality and doesn’t give gamers ear fatigue (even with glasses!). I’m not the biggest fan for the visual design but everything else is marvellous. This is a fabulous product and whoever is disappointed by this €170 purchase is either deaf or lying. 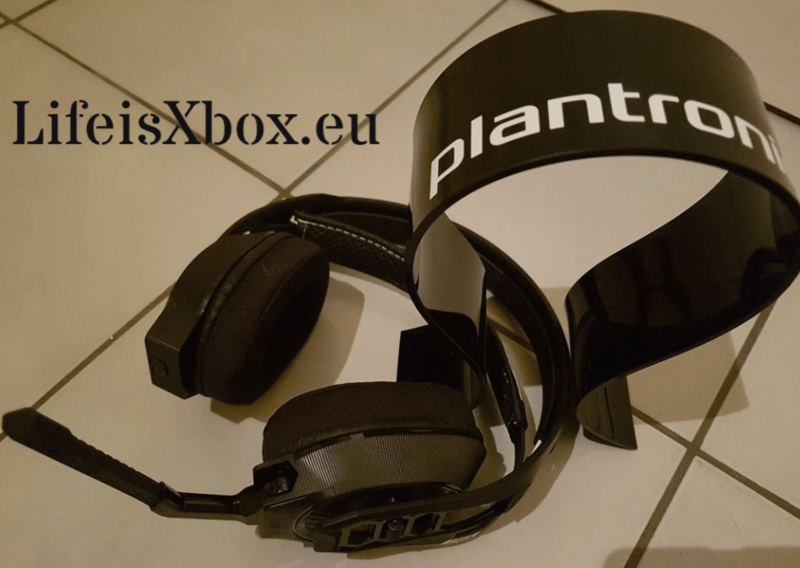 Plantronics gave us a RIG 800LX review unit, we would like to say thanks for trusting us with writing an honest impression. Dae Jim tested the RIG 800LX for 30 hours on: Assassin’s Creed Origins, Star Wars Battlefront 2, Super Lucky’s Tale, Forza 7, Hand of Fate 2, Netflix and Spotify.